Meet Jared. Here’s the mastermind in charge of Digital Gold, a cryptocurrency mining operation based in Pennsylvania. He’s a little crazy, and he’ll be the first to tell you that. Part of it is because, like so many miners, he’s in the midst of a roller coaster ride across the Wild West. Like many pioneers, he came from humble beginnings. The day before Thanksgiving 2013, he had his first mining rig operational. It was a homebrewed concoction he and his friends fashioned out of graphics cards wired into milk crates. That day, the dollar value of a Bitcoin hit $1,000 for the first time. Bitcoin value has since multiplied seventeen-fold. His company, Digital Gold LLC, sells custom-built mining rigs and collocates them for a $1 per CPU, per day. It gives investors a chance to earn cryptocurrency by hashing block chain transactions. He takes care of parts procurement, setup, and maintenance of the equipment. 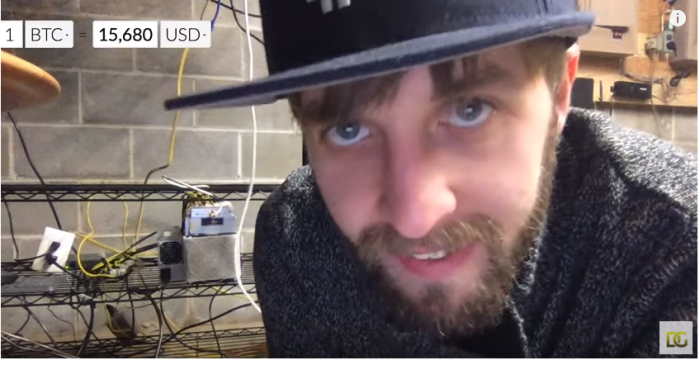 He builds the rigs, and builds community as well—his Youtube channel is dedicated to schooling new prospectors on how to mine for profit, and has a healthy subscriber total nearing 20,000. He makes his career like this. He graduated to entrepreneur after working in retail, first for RadioShack and then at the Genius Bar at an Apple Store. Building PCs interested him from a young age; he started tinkering at age 10, then in sixth grade he sold his first custom build to a family friend. The biggest challenges for maintaining a cryptocurrency mining operation? Jared has dealt with blown circuit breakers, ISP BS, floods, hand injuries that need multiple stitches—but a rig that runs hot is his worst enemy. Newegg and NeweggBusiness are long-time supporters of cryptocurrency mining operations. For obvious reasons, we try to cater to miners’ needs as best we can. One way is accepting Bitcoin for purchases. Moreover, often times it is challenging for miners to source the number of graphics cards they need to grow their rigs appropriately, and we try our best to deliver for the community. Thanks for the heads-up. We’d better get to work. hahaha, All Your Base Are Belong To Us ..
nicehash.com I mean.. gone.. don’t use it.. hacked.. The following line “His company, Digital Gold LLC, sells custom-built mining rigs and collocates them for a $1 per CPU, per day.” should be $1 per GPU correct?